My data concluded that water has a conductance of 1.11×10^-7 siemens. The conductance of orange juice is 0.62 siemens. The sports drink Gatorade has a conductance of 0.63 siemens. These results prove my hypothesis false. In accordance with prior knowledge, orange juice has almost no conductivity, and thus it is equivalent to the control group. Because a higher conductivity means a higher electrolyte count, sports drinks actually have a greater quantity of electrolytes than orange juice, and this is why my hypothesis was wrong. However, the difference in conductivity between Gatorade and orange juice is only a one hundredth. This means that there is very little reason to choose Gatorade over orange juice. Orange juice has vitamins like folic acid, calcium, and potassium, and other natural benefits such as the ability to prevent diseases, and improve a person’s circulation. Gatorade is, in part, drunk due to its well known brand name and reputation. In reality, with only a one hundredth difference between a natural drink containing many helpful vitamins and minerals, and one made of chemicals such as those that cause food coloring, it is not a incredibly hard to see which is more profitable to the body if drunk during exercise. 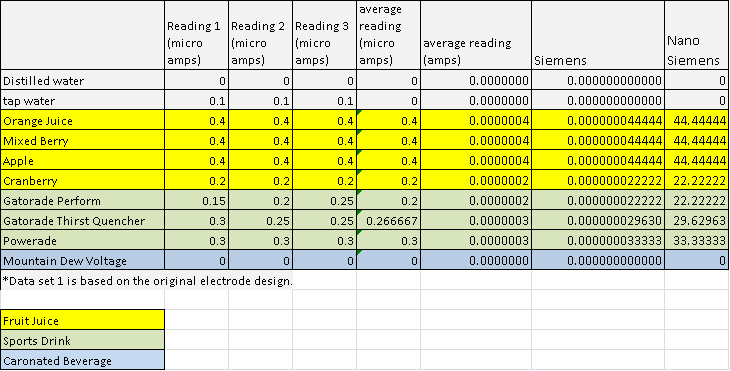 The only thing that I could have done differently in order to gain more accurate results is to have designed a better conductance sensor. The wires in the sensor repeatedly fell off of the tube and because of this I wrapped a small piece of masking tape around the tube so that the wires would not come off. When the tape got to wet, it would fall off, and had to be replaced with more tape. Also, the clips connecting the battery to the wires also often came loose, and thus they had to be constantly reconnected. Whether the faulty conductance sensor had any effect on the outcome of this experiment is unknown. It is quite possible however, that it was this problem which caused the small difference in conductivity between the sports drink and orange juice, and that their conductivities really were equivalent. The electrolyte content of beverages was determined by passing a constant D.C. electric current between two electrodes in the beverage and recording the resulting flow of electric current in microamperes. The measured current is proportional to the electrical conductance, which is directly related to the electrolyte content of the solution. All assessments were done in triplicate at room temperature to minimize measurement error and the resulting data points were averaged for each beverage. Distilled water, which does not contain electrolytes, was used as a negative control in this experiment. Variables such as temperature, time of assessment, amount of beverage and electrode were held constant so to not impact the independent variable, which was type of beverage. The dependent variable, electric current, was used to calculate the conductivity of each solution as an indicator of the electrolyte content of the solution. The original electrode design yielded small currents which were difficult to measure. Therefore, the electrode was redesigned with a greater surface area so that the currents produced were greater and more accurately measured. 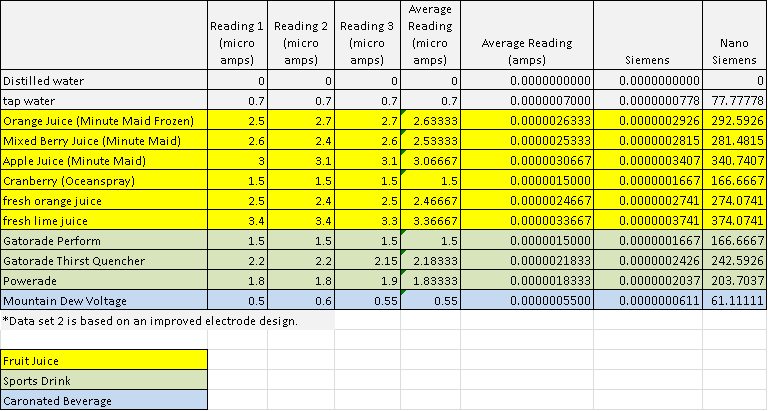 The results represent the data obtained from the improved electrode design (electrode 2). Overall, the individual readings were fairly consistent with little variability between the triplicate assessments of each beverage. The beverages that yielded the highest conductance as measured in nano Siemens, and therefore exhibited the highest electrolyte content, were lime juice (374ns), apple juice (340ns), orange juice (292ns) and mixed berry juice (281ns). 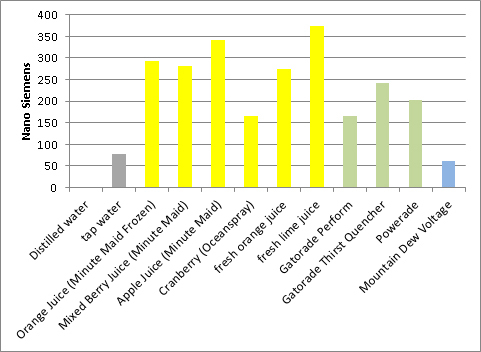 Gatorade Thirst Quencher had the highest conductance of all the sports drinks tested (243ns), but the amount was still less than the conductance of the fruit juices. The one fruit juice that had a low electrolyte content was Oceanspray pure cranberry juice (167ns). Additionally, fresh orange juice had similar electrolyte content to the frozen concentrate. Of all the beverages analyzed, tap water and Mountain Dew Voltage had the lowest electrolyte contents. The results from this experiment indicate that the electrolyte content of common fruit juices, namely lime, orange, apple and mixed berry have a higher electrolyte content than typical sports drinks. The original hypothesis of this experiment was that orange juice would contain a higher electrolyte content than that of common sports drinks. The data obtained in this study supports the original hypothesis and also showed that lime, apple and mixed berry have a higher electrolyte content than the sports drinks measured here. Sports drinks are marketed as a quick way to replenish electrolytes following strenuous activities. However, results from this experiment demonstrate that fruit juices are a better source of electrolytes. Electrode design turned out to be a key determinant of measuring conductance in a solution. The experiment was replicated with an improved electrode design in order to produce higher electric current for analysis. The improved design, using a greater electrode surface area, was critical for producing high currents in solution and for comparison of the beverages. The use of this improved design is recommended for future studies. Comparison of other popular sports drinks and other fruit juices is also recommended.